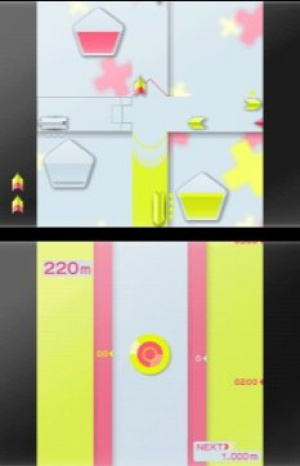 Games in the Art Style series have a reputation for originality, aesthetic invention and for being among the highest quality games on WiiWare and DSiWare. Art Style Intersect, however, is a remake of an old GameBoy Advance title known as DigiDrive, originally produced by Q Games of Pixeljunk fame. 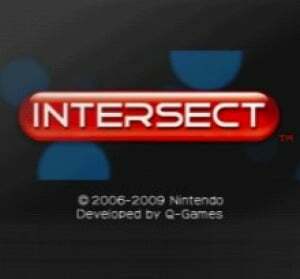 Although it might sound off-putting to download an old GBA game that was in itself an homage to old-school gaming as part of Nintendo’s Bit Generations title, Intersect easily lives up to the quality of the Art Style series and is a tremendous example of addictive puzzling. Like all great puzzle games, Art Style Intersect asks you to organise things according to colour. You start with an empty crossroads – or, wait for it, intersection! – down which cars of various colours travel. All you have to do is direct them down one of the four roads, building up chains of the same coloured cars. When you collect five in a row, you gain a small amount of fuel, which is the real crux of the game – the more fuel you have, the further away you can fire your Core from the ever-nearing Spike. The most straightforward way to amass fuel is by directing five of the same coloured car down the same road, at which point the road takes on that colour. If you accidentally send a white car down a red road, for example, you lose any fuel you had stored up in your red road – that is, unless you have another road of a different colour, in which case the fuel reserves are combined. Even better, if you have three coloured roads, sending a car down a different coloured road actually doubles its fuel reserves and combines it with the other roads. Better yet again is to get four coloured roads, activating Overdrive mode, where every car of the right colour adds extra fuel to your stocks, getting faster and faster until you misdirect a car and it ignites your reserve. Clear as day, right? It all makes perfect sense when you’ve played a few games. 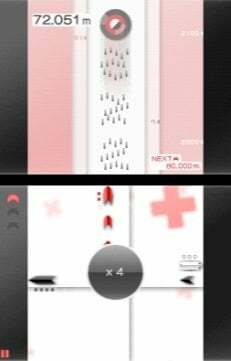 All you’re doing is shepherding red, black or white cars towards other red, black and white cars, connecting as many of the same colour as you can and building fuel. The more fuel you have, the further your Core will fly when you ignite the fuel with one of your detonating cars, easy to tell by their lovely siren. You can summon one of these bomb cars with a press of A (in Button Mode) if you have one in reserve; if not they tend to come along more or less when they feel like it. The main advantage of playing in Touch Mode is the ability to ignite your fuel reserves by simply tapping them, but you can only do this so many times, with extra ignitions earned by sending your Core higher and higher. After ten minutes you’ll likely have experienced the thrill of your first Overdrive, created your first square fuel cell (your fuel reserves inexplicably change shape as they get bigger) and had a few near misses where your precious fuel nearly got destroyed. These experiences are precisely what makes Art Style: Intersect so addictive – once you’ve figured out the rules it becomes an exercise in extreme coordination, timing, planning and blind luck. As the not-at-all-suggestive Spike approaches the Core and gets ever nearer, the feeling of success as you ignite your circle of fuel and escape at the last moment is as satisfying as any puzzle game you’re likely to have played. The main game mode is Endless Mode, where you attempt to fire your Core as high as possible whilst avoiding the oncoming Spike. There’s also a competitive mode where you take on a CPU or human opponent in a tug-of-war variant on Endless Mode where you try to force your Core to the top of the screen. Versus mode spices things up with power-ups that let you launch a quick attack, steal your opponent’s fuel or slow down their cars. It’s difficult to tell when to deploy these power-ups as there’s no way of seeing your opponent’s progress, so often you’ll waste a steal through not being able to see even a small version of their screen. Playing against a human opponent makes it easier to spy on what they’re doing, but it’s a shame you can only play in DS Download Play – having two screens and using the D-Pad and face buttons would have made a brilliantly competitive game. By passing certain milestones in Endless or VS CPU mode you earn medals which unlock higher difficulties, different music and themes. With three difficulties, three music tracks (or silence) and seven graphical themes there’s no shortage of stuff to unlock, and getting gold medals in Normal or Hard difficulty is enough of a challenge to keep you going for hours. In fact, that brings up one of its problems – a successful game can take anywhere from twenty minutes to an hour or so, but there’s no suspend or save mode, meaning if you have to cut your game short you can either quit and log your score or close your DSi and pick it up later. It’s not a game-breaking fault but it would have made it much easier to dip in and out of a good game. That’s really the only major detraction from Art Style Intersect. The core gameplay shines with the polish of a team who clearly knows puzzle games inside out, and is a beautiful combination of audio and graphical clarity. The rhythm generated by successful play is as enjoyable as the gameplay itself, a mixture of relaxing and euphoric that’s hard to get out of your system. Intersect is a masterpiece of addictive puzzling – a potent culmination of the series’ trademark soothing aesthetics and completely frantic and infuriating gameplay. Though not the simplest puzzle game around, once you’ve mastered some of its tricks Art Style Intersect will have you hooked. Will definitely be getting this one. Great review! Art Style continues to by my favorite thing about having upgraded to the DSi. is this game out in america? psst... Tingle, look at the top right of the page under "GameOverview". Lots of handy info. Would be nice to know if there are any differences to the GBA original (besides the graphical change). If there aren't then I definitely can't agree with the score as I found this to be the weakest bit generations title. The only difference seems to be with unlockables and while bomb cars appear randomly in touch mode you, the player can't summon them. Instead, you can touch a fuel stack to ignite it (though just like the summonable bomb cars you're limited in how many times you can do this). Can't wait for this to hit the US. The original already had unlockable music and skins if my memory's not off. But Touch mode sure is new. So thanks for the info on that. Seems like people owning and enjoying the original don't need to pay another 5 bucks then. Great review and definitely will be getting this game for sure when its out in the US but who knows it could be out tomorrow for the US update! Man, I love me some ART STYLE! Nice review James, you got me pumped about this one. Great review!!! i TOTALLY agree! I want this in North America... badly!!!!! That's the last of the GBA Bit games to make the Art Style leap now, eh? Been waiting for this one, excellent review! I thought there were only going to be 6 DSiWare Art Style games. @Panda There were six GBA Bit Generation games, so far we've had three converted to Art Style games. I'm hoping Dot Stream makes the jump myself! Hmmm... This game looks pretty nice, but I think I will wait until next friday... If they don't release Dragon Quest Wars, I will get this. EDIT: Oh, almost forgot - STORAGE SOLUTION FOR DSi Nintendo please!. The score is absolutely justified, Intersect and Digidrive are great. Awesome, can't wait to download this! Makes me wonder though if Nintendo's just given up Art Style games for WiiWare altogether? "It’s difficult to tell when to deploy these power-ups as there’s no way of seeing your opponent’s progress, so often you’ll waste a steal through not being able to see even a small version of their screen." I love Art Style, and this does look like it could be one of the better games in that series. Will definitely give this a go. @ MindFever: So they got heaps of former UMD titles now for download at a price that more often than not exceeds the price for a used copy...so what's to envy? Simplicity itself, but great idea! And sooooo addictive! I love from the 1st sight! The VS mode is very challenging for me, far more difficult than the Endless mode. Can't wait til this hits America! This game sounds pretty neat. I'd like to download one of the art style games for DSi. Are there any that you guys would recommend in particular in the US? I'll probably gget this when it comes out in the US!! I can't Wait! @Corbie I see you've changed your avatar now since the PSP go has come out. Is it worth it? This is the essential Art Style game. It's been released today in America.. lets see how this one fares. Looks like it's gonna be a winner! One nitpick about the review: the opening paragraph says "however" it may be offputting to know that this was originally a GBA title, in reference to the expected quality associated with Art Style. But Art Styles roots are in the Bit Generations GBA games. This is at least the third Art Style game to be remade from a BG game, so I'm not sure why this would be thought of as a contradiction by anyone at this point. Just a nitpick though, very informative review, thanks! I'll be downloading this today now that I've beaten NSMB Wii. I love Q Games. I wish they would do more with Nintendo's consoles, as I think they'd be a perfect match. I am having many hours of fun with this game. This is my favorite dsiware game to date! I urge every puzzle fan to download this. The music, "trance mode", the addictive hours I have spent here and there trying to unlock different themes and sounds. Greatness achieved. I give it a definite thumbs up! !